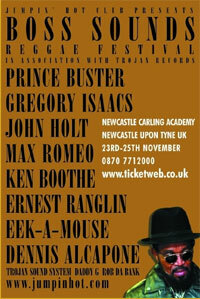 If you happen to be in the north east over the weekend of 23rd – 25th November, it might be worth picking up tickets for the Boss Sounds Reggae Festival in Newcastle. The event is promoted by Newcastle’s ‘Jumpin Hot Club’ in association with Trojan Records which is celebrating its 40th Anniversary. The line-up is pretty impressive, including Prince Buster, John Holt, Ken Boothe, Gregory Isaacs and Dennis Alcapone, as well as some top-notch DJ support from the likes of Massive Attack’s Daddy G, Trojan Sound System and Rob Da Bank. There’s also Jamaican food and photographic exhibitions around the venue. See the website for full details and running order, with tickets available to order here.